Hope you're all enjoying your four day weekend (if you're in the UK!)... I'm about to go and feed the ducks with my son, boyfriend and his parents, which should be lovely. It was so rainy today but it's cleared, so I'm just hoping the weather holds out! Today is day two of my Nails Inc marathon! This is called Marble Arch and it's a half berryish, half dusty pink creme. I had a really hard time photographing this, my camera could only pick up the berry element, when really the colour of this was a lot more subdued. I messed about with my white balance and contrast and so the photos are a lot more colour accurate now! The formula of this polish wasn't as nice as the others that I've used so far, it was a bit gloopy and stringy at times. I think I'll get some thinner for this for next time I want to wear it. The photos below show two (thick) coats with no topcoat. This was so shiny without any topcoat! Natural light - so shiny! 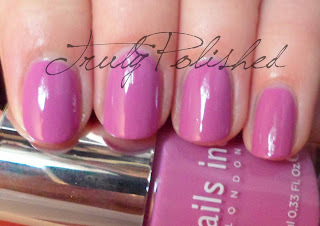 I love this colour so much, it's feminine without being girly and colourful without being too bright! The nail polish sets I bought have really made me a fan of Nails Inc after I was boycotting them! I'm so glad I'm wearing this brand again! This shade isn't available on the Nails Inc site anymore but definitely check your local TKMaxx for the £24.99 set of seven polishes that I bought, it's a real bargain!